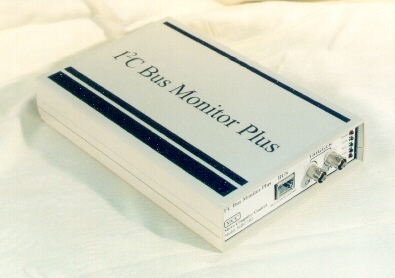 The I2C Bus Monitor Plus is our laboratory grade troubleshooting instrument for the I2C Bus and derived protocols. This software brings this instrument to life, providing tools to capture, log, filter, analyze, and display bus data. Microsecond Timestamping of Bits, Bytes and Messages. Non-intrusive capture of bus traffic to 400KHz. Software controlled SCL and SDA Logic Voltage Levels. Display Filtering on message Slave Address, R/W, Ack/Nack, Data Bytes, and smart battery Protocol Violations. I2C Bus and Derived Protocol Development Tool. 256K byte Data Recording Memory. Supports General Calls, and Multi-Master/Multi-Slave Addressing. Displays Start/Stop Events, Device Addresses, Read/Write Requests, Acknowledgments, Data, and Bit, Byte, and Message timing. Trigger Input for synchronization with external events. Trigger Output on bus events or pattern match for triggering external test equipment. Correct parsing of smart battery negative signed parameter values. This copyrighted software is offered free of charge to users of the MCC I2C Bus Monitor Plus. Its use is covered by the MCC license agreement available during installation. Windows XP (32-bit), Vista/7/8 (32-bit or 64-bit). Previous versions of this software DO NOT need to be uninstalled before installing this software. Make sure you have installed the latest Windows updates and service packs. Click on the link below to download and save the .ZIP file to a temporary folder on your computer. Right-click the downloaded .ZIP file and select "Extract All...". Double-click on the extracted Setup.exe file to begin the installation. For additional information, see the Installation Section of the User's Guide.